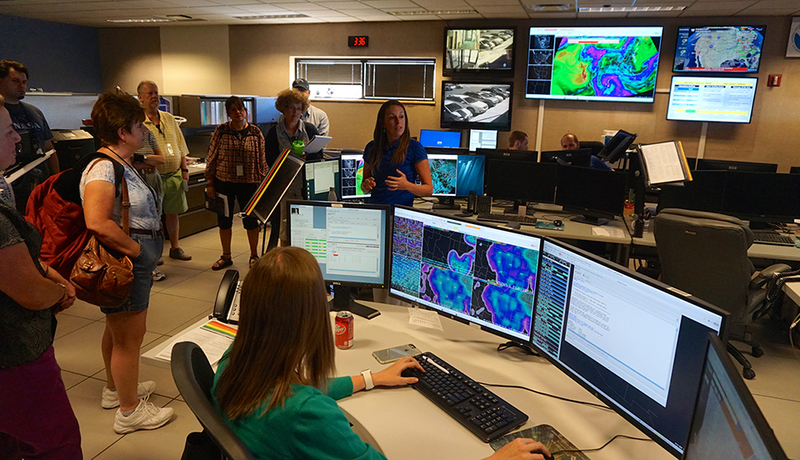 NOAA Meteorologist Megan Taylor gives a tour of the National Weather Service’s forecast operations office in Flagstaff, Arizona, to local teachers participating in a three-day NOAA Planet Stewards professional development workshop. In Fiscal Year 2018, NOAA Planet Stewards expanded its roster to over 2,100 formal and informal educators, and engaged more than 3,750 educators in monthly NOAA Planet Stewards Webinars. Nationally recognized scientists, educators, and communicators led webinars and workshops that focused on the regional impacts of climate change to local communities and indigenous populations, engaged students in hands-on STEM education, and integrated the themes of community resilience and stewardship into educators’ efforts. Standards-based learning opportunities and the Next Generation Science Standards were also highlighted. Webinar participants learned about coral bleaching, marine debris, the Meaningful Watershed Educational Experiences project, water quality and shellfish, simulations, models and game design for teaching Earth science, and extreme weather preparedness. Follow-up evaluations indicated that 95 percent of webinar and workshop participants learned from their webinar experiences. Respondents also reported that they planned to use what they learned in their work during the next year by sharing information and resources with approximately 133,000 colleagues, youth, and adults. Planet Stewards also held face-to-face workshops in Illinois, Arizona, Texas, Hawaii, and at the National Science Teachers Association National Conference in Atlanta, Georgia. NOS’s Information Management Office extended its foundational Information Technology infrastructure into the Microsoft Azure cloud during Fiscal Year 2018. Users can now log into the NOS cloud environment using secure Common Access Card authentication. Many NOS Program Offices are using the cloud to move essential products to a secure environment, which will provide additional resilience in the event of natural disasters at NOS locations. Moving into the Microsoft Azure cloud will also enable future functionality like cloud-based “desktops” that will support an increasingly mobile NOS workforce. Traffic to the NOS website has increased 42 percent since NOS launched its mobile-friendly redesign in Fiscal Year 2014. Google searches accounted for 303 million impressions in Fiscal Year 2018. This means that 303 million people were presented with NOS page results based on the search terms they used. Of that 303 million, 8.78 million people clicked on a link to get to the NOS website. The NOS website average ranking on Google search pages is 8.2, which means that NOS pages are overwhelmingly presented near the top on the first page of Google results when people search for ocean- or coastal-related terms or phrases. This applies not only to the U.S., but for the entire English-speaking world. In Fiscal Year 2018, NOS Instagram followers increased 88 percent (from 37,582 followers to 70,939 followers). The number of Facebook page “likes” grew two percent (from 111,373 to 113,659), the number of Twitter followers grew four percent (from 170,172 to 176,804), and lifetime video views on the NOS YouTube Channel grew by 49 percent. This year marked the sixth 30 Days of the Ocean campaign, held in June, to celebrate World Ocean Day and National Ocean Month. Popular content included NOS’s World Ocean Day video (reach potential of 2.97 million views on Twitter and 13,000 views on Facebook), and a post about how far light travels in the ocean (reach potential of 1.14 million views on Twitter). Building on NOAA’s mission of science, service, and stewardship, the NOAA Planet Stewards Education Project (PSEP) made significant contributions in Fiscal Year 2018 that resulted in the protection and conservation of resources entrusted to NOAA. PSEP educators worked with students, families, and the public in 16 states throughout the U.S. Their stewardship projects delved into topics including, but not limited to, biodiversity, recycling and energy use reduction, waste reduction, climate literacy, climate change adaptation, tree planting, invasive species removal, school gardens, and habitat restoration. A total of 2,139 students, 136 educators, and 163 parents and partners were involved in these stewardship projects. Students spent over 4,100 hours learning about the science related to their projects, and spent 9,188 cumulative hours engaged in stewardship activities. They planted over 2,000 plants, sequestered thousands of pounds of carbon, and kept several thousand pounds of recyclable material out of landfills.